GT5500 ultra short throw projector with audio from ceiling speakers, connected and controlled by Control4. Trusted Technology specialises in the design and installation of technology-driven solutions that make homes and businesses a more enjoyable, comfortable and secure place to work and play. 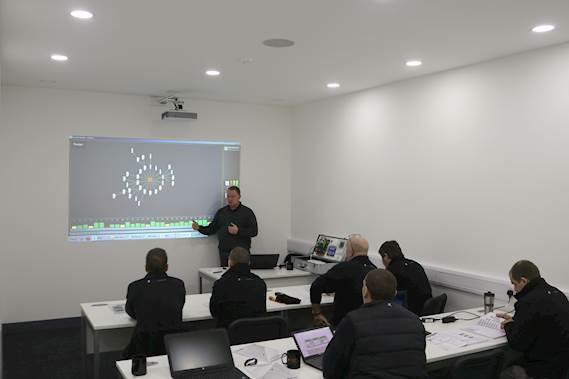 “This new training academy gives us the ability to continuously train our engineers on the latest technology to ensure we stay ahead of the curve and achieve our goal of becoming the UK’s most trusted installer of technology products. “I am grateful to Optoma for its support in making this project a reality and will continue to recommend its products to others looking for similar installations." Задача: Trusted Technology decided to build its own training academy and needed a very bright ultra short throw projector to cope with the training room’s ambient light. Решение: The company chose one of the brightest Full HD ultra short throw projectors on the market – the Optoma GT5500. Trusted Technology has a team of 12 Technologists working throughout the UK on residential and commercial projects. The company has a dedicated training policy to ensure its engineers receive continuous training on the wide breadth of products, technology and solutions the company installs. But with its engineers living across the Midlands and training from manufacturers based throughout the UK, often meant engineers travelling long distances or having to stay away from home to get to training events. The Trusted Technology team decided to build its own training academy to teach up to 16 people on the latest AV equipment. 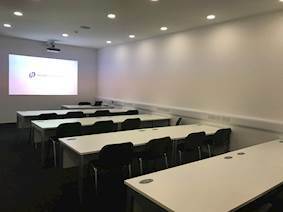 It refurbished the bright airy rooms within its Mansfield-based headquarters for the academy and concluded they would need a very bright ultra short throw projector to cope with the ambient light. The company chose one of the brightest Full HD ultra short throw projectors on the market – the Optoma GT5500. This projects a 100-inch image from just 30cm from the screen. An integrated speaker provides powerful sound and its two HDMI inputs make set up simple. It can be turned it into a smart projector by connecting a HDMI dongle like the HDCast Pro, Google Chromecast® and Amazon Fire and with an impressive brightness of 3,500 lumens, it can be used with the lights-on. 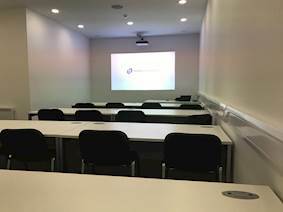 The projector is used to show training videos and presentations with audio from ceiling speakers, connected and controlled by Control4. The huge projected imagery allows Trusted Technology to share content with the whole room. Rather than sending its engineers to various training venues across the country, Trusted Technology now has the facility to train the whole team in one central location in the Midlands. And by basing this at its headquarters, it is saving the company both money and time. And with a shortage of venues in the Midlands area, this could also be used by partner manufacturers for independent courses. The company has committed each of our engineers to spend 20 days training to increase their knowledge of home automation and commercial AV systems. Andy said: “This new training academy gives us the ability to continuously train our engineers on the latest technology to ensure we stay ahead of the curve and achieve our goal of becoming the UK’s most trusted installer of technology products. “I am grateful to Optoma for its support in making this project a reality and will continue to recommend its products to others looking for similar installations."